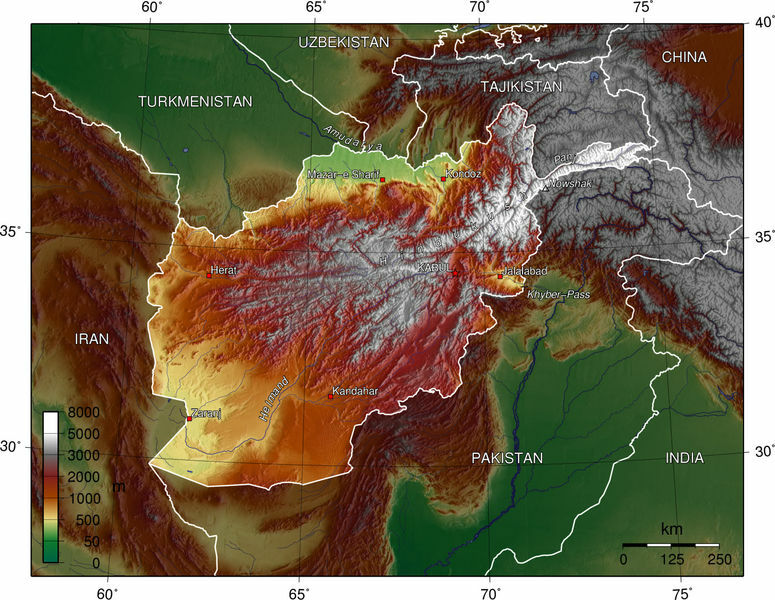 [Image: The topography of Afghanistan, a sign of deeper tectonics. In a cave somewhere amidst those fractal canyons sat Osama bin Laden, in the darkness, rubbing his grenades, complaining about women, Jews, and homosexuals...]. "The area that is now Afghanistan started to take shape hundreds of millions of years ago," the article explains, "when gigantic rocks, propelled by the immense geological forces that continuously rearrange the earth's landforms, slammed into the landmass that is now Asia." From here, rocks "deep inside the earth" were "heated to thousands of degrees and crushed under tremendous pressures"; this caused them to "flow like taffy." And I love this next sentence: "Just like the air masses in thunderstorms, the warmer rocks rise and the cooler ones sink, setting up Ferris wheel-shaped circulations of magma that drag along the crust above them. Over time, these forces broke off several pieces off the southern supercontinent of Gondwanaland – the ancient conglomeration of South America and Africa – and carried them north toward Asia." Of course, Afghanistan – like most (but not all) of the earth's surface – was once entirely underwater. There, beneath the warm waves of the Tethys Seaway, over millions of year, aquatic organisms "were compressed into limestone." "Afghanistan's fighters find shelter in the natural caves," the New York Times continues. "They also make their own, often in the mountains of crystalline rock made of minerals like quartz and feldspar, the pieces of Afghanistan that were carried in by plate tectonics. 'This kind of rock is extremely resistant,' Dr. Shroder said. 'It's a good place to build bunkers, and bin Laden knows that.' Dr. Shroder said he believed that Mr. bin Laden's video in October was taken in a region with crystalline rocks like those south of Jalalabad." All of which makes me think that soldiers heading off to Afghanistan could do worse than to carry bulletproof copies of Jules Verne's Journey to the Center of the Earth along with them. As another New York Times article puts it: "Afghanistan is a virtual ant farm of thousands of caves, countless miles of tunnels, deeply dug-in bases and heavily fortified bunkers. They are the product of a confluence of ancient history, climate, geology, Mr. bin Laden's own engineering background – and, 15 years back, a hefty dose of American money from the Central Intelligence Agency." Bin Laden et al could thus "take their most secret and dangerous operations to earth," hidden beneath the veil of geology. (Elsewhere: Bryan Finoki takes a tour of borders, tunnels, and other Orwellian wormholes; see also BLDGBLOG's look at Terrestrial weaponization). "With the United States' advanced detection devices and high-technology munitions, the network of Afghan caves and tunnels is neither as befuddling nor as impregnable as it was to the Soviets. The Pentagon says American warplanes have been bombing carefully selected caves and tunnels for weeks now, directing 500-pound bombs at their mouths to block the entrances and larger munitions to hit suspected weapons dumps and other strategic sites. Mr. Rumsfeld said last month that some strikes had produced 'enormous secondary explosions,' sometimes continuing for hours after American jets first attacked. The karezi were designed to collect water seeping from beneath stream beds and aquifers, but for centuries -- at least since the days of Atilla the Hun, and some say since the invasion of Alexander the Great -- Afghans have used them to hide from enemies and to conceal troops for rear-guard ambushes after an invading army has passed. 'They're multi-level, dogleg tunnels. They have air vents and escape hatches out the back,' said John F. Shroder Jr., a geologist and geographer at the Universitry of Nebraska at Omaha who prepared the national atlas of Afghanistan in 1970. Mr. Shroder said he was in the region in the 1980's and is familiar with many of its karezi and caves. Some military experts think such fortresses can be taken only by ground assaults -- and that even then, anyone hiding in them may manage to escape through a hidden exit. 'You might live to fight another day and leave a lot of dead people behind you,' Mr. Shroder said. Since 1998, government documents state, the Pentagon and other agencies have tested bombs and explosives at the White Sands Missile Range in New Mexico against blast-hardened structures above and below ground in a program aimed specifically at terrorist tunnels and other hardened targets. Among the techniques being tested are 'thermobaric' bombs that detonate a mixture of fuel and air to cause a huge shock wave. Such bombs already have devastated Taliban positions in Afghanistan, but early this year, senior Pentagon commanders gave the go-ahead to test a thermobaric weapon customized for attacking tunnels. The goal was a modified version of a bomb like the GBU-28, a 4,700-pound laser-guided ''bunker buster,' or the AGM-130, a guided missile with a 2,000-pound warhead, both of which are being used in Afghanistan. Such a weapon could be fired into a tunnel precisely, but would explode with much greater force than current bombs. If Mr. bin Laden is still holed up then, they should be ready to use." Thanks, Octo. Thanks for stopping by the event last weekend, too, if I haven't said that already. 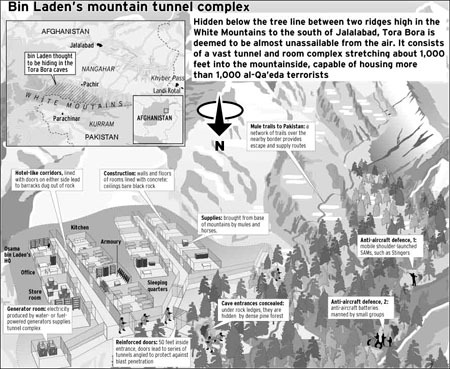 In the great BBC documentary series, The Power of Nightmares (available at archive.org, download fans), there's a glimpse of Rumsfeld on some tv news show holding up a cutaway diagram with an artist's impression of a multi-level Taliban underground complex. Would be hilarious if it wasn't so dismaying, seeing the Defense Secretary trying to pass off a James Bond style villain's lair as a believable construction somewhere in Afghanistan. One thing we do know: Osama is a Mac-user. One photo of him circa 2001 in a UK paper showed him with a couple of CRT iMacs behind him. Can't imagine Apple using that in their Think Different campaign somehow.